It was an exciting final day of the term at Earls Hall! The morning started with the children taking part inn our two simultaneous ‘Celebration Assemblies’ which saw children from each class awarded with certificates for individual achievement. There were certificates for ‘Earls Hall Stars’, times table and reading efforts and achievements. Well done to all of the children presented with certificates this morning, we are proud of you! In the afternoon the excitement levels hit fever pitch as we were paid our annual visit by the Easter Bunny! Our fluffy tailed friend visited each class, supported by Mrs Ludlam and Mr Town, in order to deliver eggs donated by our PTA. 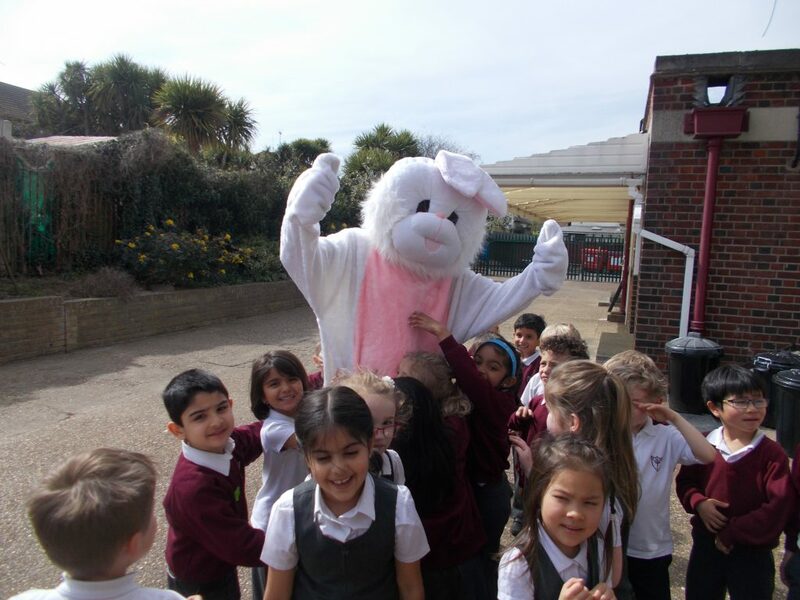 The children were all well behaved and the Bunny left feeling proud of them for another year. At the end of the afternoon the ‘Learning Ambassadors’ from each class met with Mrs Irwin; one of our school governors. The children told her all about the learning which has been taking place across the school throughout the week. Well done to all of the ambassadors, we are proud of you! After school the PTA held another cake and uniform sale which this time saw children from across the school invited to take part in an Easter bonnet parade! The children had decorated hats of all shapes and sizes and prizes were awarded to winners from different age groups. Well done to everyone who took part!